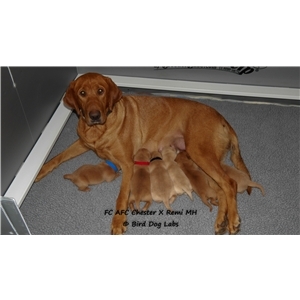 Exceptional dark yellow/fox red litter born September 26th. Currently 2 male spots available! AKC Breeder of Merit and Bred with H.E.A.R.T. Breeder! 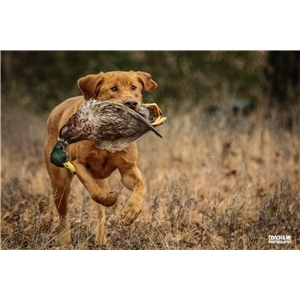 Bird Dog Labs LLC is very excited about this special litter. These puppies are bred to be excellent working dogs (field trials, hunt test, hunting, SAR, etc) that also make wonderful family companions! These puppies will be born and raised in our home. 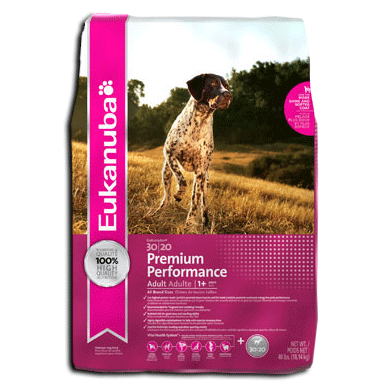 We have a comprehensive puppy program to give them an excellent start. At a minimum this includes: early neurological stimulation, early scent introduction, daily individual attention, appropriate introduction to wings/birds/bumpers, crates, car rides, obstacles, adventure walks, gunfire from a distance, daily loud noises, water (weather permitting) and thorough socialization. All puppies have dew claws removed, 1st round of vaccinations, microchipped, appropriate worming schedule, vet checked, individual health certificate and come with a 30 month hip/eye warranty and lifetime guarantee to never be affected by 15 different genetic diseases. We also offer lifetime breeder support. This litter will be one of the nicest all around litters available anywhere in the country. We selectively bred Chester to Remi because of how well they complimented each other. The color of the puppies is purely a bonus. FC AFC Chester is a consistent performer in field trails for his owners the Hays. 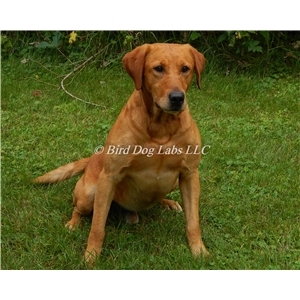 He is a very handsome fox red shade of yellow and has the conformation a Labrador Retriever should have. Very solid and athletic. Chester has a very happy, outgoing personality. Chester is OFA hips excellent, elbows normal, eyes normal and tested clear of EIC, CNM, PRA, RD/OSD, DM, HNPK, SD2 and dilute free. 75 pounds. Remi MH is an absolutely stunning, 78 pound dark fox red female that is excellent in both the field and home. She is a 3rd generation of our foundation line and possesses all of the traits we breed for. She loves to work, yet turns it off in the home and is a very affectionate companion. Remi has a striking appearance and everyone that meets her comments on how beautiful she is. Remi is extensively health tested and all can be verified online. OFA hips good, normal elbows, normal eyes, normal cardiac and normal thyroid. Remi is clear of everything on both the Essential and Supplemental panels by PPG (15 different genetic diseases). She is also dilute free. We post regular pictures and/or videos on our Bird Dog Labs LLC Facebook page. Shipping is available for cost.